Read 2 times. Last read January 6, 2019 to January 10, 2019. Very inspiring, if you're thinking of eliminating sugar from your diet. I've done so (again). It isn't easy to get off the sugar-bandwagon in our civilization, but author Eve O. Schaub decided this was what her family needed to do. She has a lot of tips for those avoiding sugar, and there are recipes at the end of the book. Because she had children, she needed to devise healthy no-sugar deserts. She used whole fruits and figured they were ok-sugar because they were in the form given to us by the Creator. This makes a lot of sense to me. I'm a long-time natural foodist type of person. Unfortunately for me, the fruit solution for deserts won't work, because I'm on the candida diet, which eliminates all sugar, even in fruits. I have a favorite desert anyhow: a sweet potato or yam, baked, with xylitol, butter, and cinnamon. Delicious. Unless of course, you desire chocolate. I somehow lost my desire for chocolate and other sugary treats when I switched over to this diet. That's why I wondered why the author and her family were given the option to cheat once monthly, to eat a sugary desert. Each of them had their personal allowed sugary treat. This is hardly "no sugar" and for me, it would be a frequent reminder of what my body doesn't need. The difference here is that my diet is mandatory and the Schaub family's no-sugar diet was optional... except that Mom decreed it. I very much appreciate this effort to promote a no-sugar lifestyle. Of all the elements of the standard American diet, sugar is one we could do without. I reread this book in 2019, inspired by the PopSugar Reading Challenge as we were prompted to read a book with “pop,” or “sugar,” or “challenge” in the title. I immediately thought of this book, and realized it wouldn't hurt me at all to be inspired to cut down on sugar consumption. I liked this book even more than I did when I read it the first time. I know she's received some criticism for forcing her children to go through the no-sugar diet with her, but her intentions were good and her entire family benefited from the experience. Another frequent criticism has been that she had exceptions to the no-sugar rule, especially for the children, so the family wasn't 100% no-sugar the entire year. Nevertheless, they cut down considerably and the exceptions are a good way to refuse to be fanatical about something, and I believe that's as important as it is to avoid fructose whenever possible. This book is mainly a memoir, but she included lots of helpful information about why fructose should be avoided, and what products she used to alleviate the distress of sweetness-cravings. I honestly believe this is an amazing book with important information everyone could benefit from. 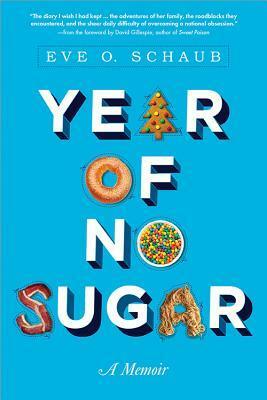 Sign into Goodreads to see if any of your friends have read Year of No Sugar.